Any site that is disturbing over one acre is required to gain coverage under the State Pollutant Discharge Elimination System (SPDES) General Permit for Stormwater Discharges from Construction Activity. As a requirement of this permit the owner must identify the contractor or subcontractors that will be responsible for installing, constructing, repairing, replacing, inspecting and maintaining the erosion and sediment control practices included in the SWPPP. This person is known as the trained contractor and is responsible for the day to day implementation of the SWPPP. 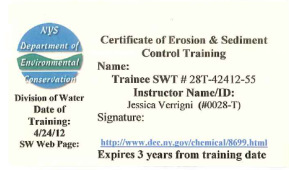 A trained contractor is defined as an employee from the contracting (construction) company identified as having received the four (4) hours of Department endorsed training in proper erosion and sediment control principles from a Soil and Water Conservation District, or other Department endorsed entity. This certification must be renewed every 3 years. In Chemung, Schuyler and Steuben Counties over 17- 4 Hour Erosion and Sediment Control Contractor Trainings have been offered and approximately 750 individuals have received their wallet cards to become trained contractors. For more information on becoming a trained contractor please contact our office at (607) 535-0878.